Most of us are smart and savvy. However, despite all the knowledge and experiences acquired over the years, we all find that we could, at times, do with some advice, some guidance. Sometimes, these insights could turn out to be invaluable. 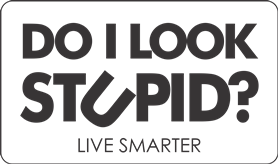 Do I Look Stupid? is a site dedicated to providing insights that could prove helpful to many of us – today or in the future. Use the insights that you like. If you agree (or disagree) with anything that we have written, comment. If you have some stories and insights that you would like to share with others, write. Share your posts and this website with your friends. Hopefully, all of us will become that much smarter, that much savvier by exchanging interesting and relevant information.